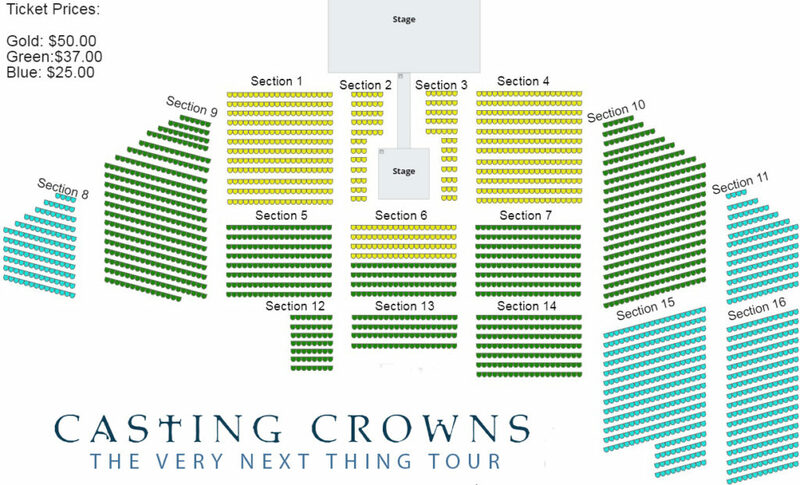 Casting Crowns, The Very Next Thing Tour with Special Guest, I Am They. Since forming more than a decade ago, Casting Crowns’ message of hope has resonated with people around the globe with total album sales surpassing 8 million. The GRAMMY® and Dove Award winning group has consistently delivered songs that spur listeners to evaluate their relationship with God and with each other. The Very Next Thing, Casting Crowns’ latest album, is centered on the idea that what’s next for the Lord is often what’s right next to you. This collection of songs, including the single “Oh My Soul” is meant to meet listeners wherever they are at in their walk and aims to encourage acting out the next step of love. Additional processing fees apply to all ticket sales. Please note seating is not tiered and is all one-level, floor seating. Limited VIP Parking will be available for $5 (Cash Only) in the Owensboro Convention Center parking lot. Available for purchase on site day of event only.